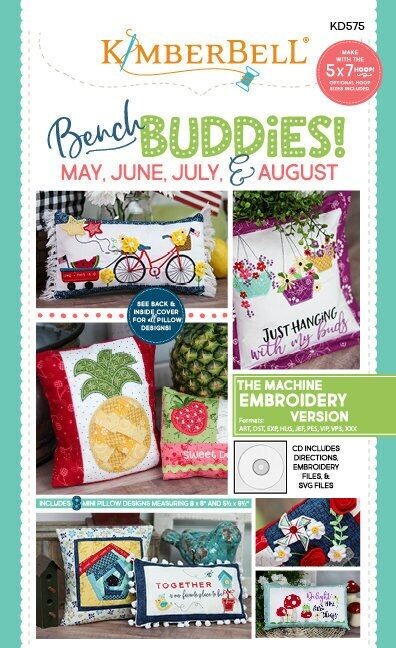 From birdhouses and baskets to flowers and frogs, the new May, June, July, and August Bench Buddies capture the wonder of the year’s warmest months. Bench Buddies beautifully match the popular bench pillow patterns. Make a new pillow cover, then simply switch out the pillow form for the new holiday and season! 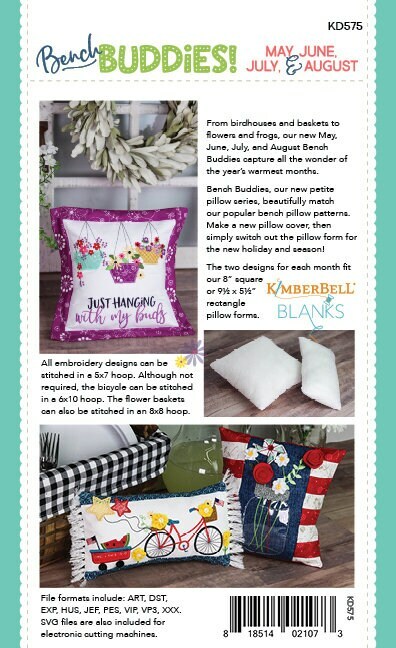 The two designs for each month fit the 8” square or 9 ½” x 5 ½” rectangle pillow forms by Kimberbell, with all embroidery stitched within a 5”x 7” hoop. Although not required, the bicycle can be stitched in a 6×10 hoop. The flower baskets can also be stitched in an 8×8 hoop.